Actually, if you wish to look natural with your false eyelashes, you need to know how to trim them. Trimming is always required for the false eyelashes you bought from the stores as they simply look “perfect”. Perfect eyelashes are good but make you look unnatural. I hope the following steps are easy to follow and you can learn to trim your”Perfect” false eyelashes! Take out the false eyelashes from the box carefully. You can take them out with your finger or with the help of the tweezers. Try to peel them from the box from the outer corner end where you usually have the trimming instead of the inner corner end. Look into the mirror, bring the right/left false eyelashes close your right/left eye, and determine the width that you want. It is best to have 2-3mm longer than your eye length. When you have decided, trim off the excess part only from the outer corner end. Tips: Trim the fake eyelashes a bit only at a time then bring them close to your eye again to see if further trimming is required. You may have to take into consideration that you have to leave 1mm at the inner end not being applied with false eyelashes to make it more natural for the decision of the width of you false eyelashes. It is important to repeat step 2 for the other eye instead of trimming the other false eyelashes at the same width of the previous one as there can be a very slight difference between your left and right eyes. Do not under estimate the effect that the slight difference of your eye can have on your whole make-up and looking! You can also trim the length according to your own preference. 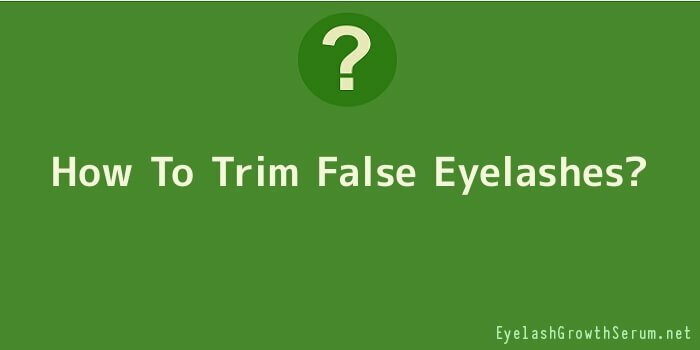 Normally, it is optional for you to trim the length or thickness, but it is true that if you trim them a bit, they look more natural on your eyes. Tips: Never let your false eyelashes look too long and thick!